Description: This is a Shivastalam in the vicinity of Tiruverumbur near Tiruchirappalli at a distance of 3 km from the Solakampatti railwaystation. This temple occupies an area of about 2 acres. There are shrines to the nayanmars and Dakshinamurthy here.The famed hymn of Sambandar 'Maraiyudaiyaai' is associated with this shrine. Nedunkalam is considered to be the 8th in the series of Tevara Stalams in the Chola kingdom located south of the river Kaveri. Legend has it that Agastya muni worshipped Shiva here. Legend also has it that when Parvati worshipped Shiva with the intention of being united in marriage, Shiva in disguise grasped her hand, and that Parvati ran away and hid in a grove, and that this shrine is also known as Olimadicholai. The east facing shrine is crowned with dual vimanams. 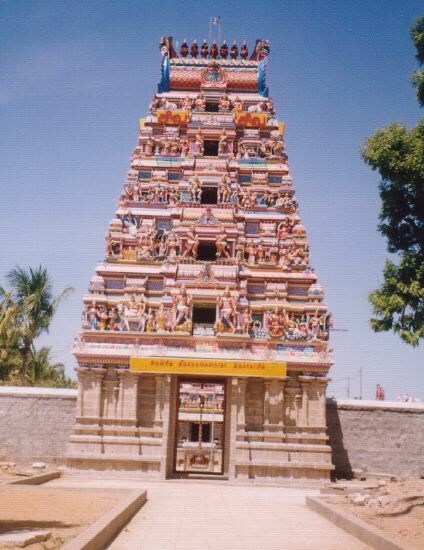 The Ambal shrine is located in the outer prakaram. Legends alluded to in the Tamil patikams are depicted in the temple tower. Four worship services are carried out each day, and Navaratri, Pankuni Utthiram and Vaikasi Visaakam are also celebrated here. Templenet acknowledges the contribution of the image above by C. Vedanarayanan, London.